Since meeting Garret on her first night at college, Jade’s had to overcome many obstacles to be with him, including interference from Garret’s father. Now, months later, it seems that Mr. Kensington has finally accepted Jade dating his son, but the reason for that is unclear. After what Jade witnessed at the Kensington mansion, she’s not sure what his acceptance of her means. Is she tied to his family forever now that she knows some of their darkest secrets? Spring semester begins at Moorhurst College and a new student arrives who has a little too much interest in Garret’s family. And a little too much interest in Jade. 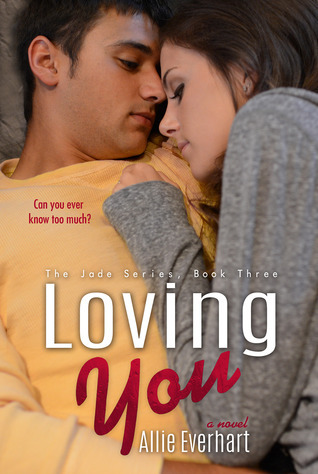 Garret continues to win Jade’s heart with romantic gestures that make her love him even more. It seems like everything is starting to work out for Jade, but as her mother used to say...Good things never last. Or do they? This book had me feeling jittery the entire time. I didn't know what to expect with everything that was going on with Jade and Garret in the first two books. This book focuses more on Jade and Garret's relationship and its progression, although it furthers a long the mystery of this secret society, that we still don't know a lot about. Loving You is very well paced it's never slow and it doesn't feel like it's repetitive. There are times where I just want to slap Jade and be like open your eyes, don't you see what is happening; but that is Jade, she is a little naive when it comes to boys and well pretty much a lot of other things as well. Garret is his sweet and charming self and as in the previous two books he had me swooning all over the place. Garret is setting the bar high for my future book boyfriends is all I have to say. By the end this book had my heart racing and has me dying to start the next book. I can't believe what happens in the last scene! I have to pick up Promising You because I just have to know what happens to Jade, after what happens I am in shock and hyperventilating! Loving You is the perfect follow up to Knowing You. I can't wait to see what Promising You has in store for me next.